Do you ever feel it’s time to color outside the lines? Do you go to the store to buy paint or curtains or your next set of couch pillows and end up bringing home pretty much the same thing you bought last time and then wonder why you’re not excited about it? Or, have you taken that step into Willy Wonka’s world and gone crazy with color? Or style. Or texture? I always wondered why people were so in love with animal prints. I SMH over hot pink painted bookshelves and pillows that look like exploded rosettes. But… change is in the wind. The time to plunge into adventure and throw caution to that wind is here. It’s time to crawl out of the brown/white/beige cave and look for something different. 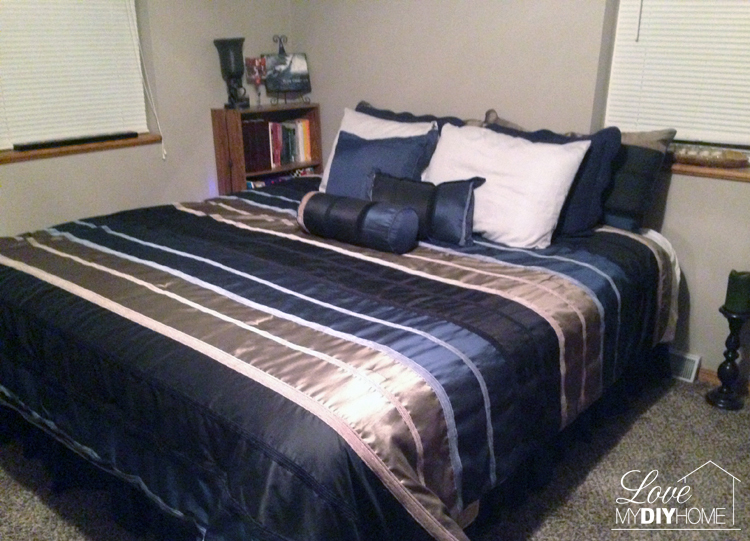 A new lease on decorating life started with a new bed set. Yep. A bed set. That was a defining moment. My daughter texted an advertisement of a bed set she was considering and it leapt out of my iphone and grabbed me by the collar and said, “Buy me or you will regret it.” I bought it and she didn’t. Here is the old bed set that has made its way into the guest room. NOTE: Hopefully the fact we have put a king size bed in there will make up for the boringness of the bed set that you just inherited. My deepest apology. I have finally put one toe into “Boring People Anonymous,” or BPA. Will you meet me there? Or are you too occupied with deciding between cream and tan? Herein lies a milestone. A new bed set – stolen (with permission) from Jillian. One must suspect she didn’t end up buying it because it didn’t have glitter on it. Jillian is the president of BPA. She’s the one buying pink glitter jeggings and animal print tops for her pre-born niece. Anyone can look through the future-baby box and pick out which outfits she’s responsible for. I want to be just like her when I grow up. She has a reputation. She’s the cool one. So do I (have a reputation). Decision time. What color paint would be best for the nightstand? Bright orange to match the dust ruffle or light peach to play it safe and keep all eyes focused on the wild new bedspread? I await your response. My future in the BPA rests in your hands. Without seeing the colors…I would choose the the light peach. As a conservative decorator myself, I would paint the end table to match the headboard and then find a peach or light orange candle holder or kleenes box. Something to tie in the theme. I think the bright orange end table would over take the beautiful quilt. Just my take. Diane, My first thought is to go with a conservative color – as always. I too am ALWAYS concerned about too much color – which has kept me in my tidy little box. That's two so far choosing "conservative". I'm anxious to see what everyone else says! I thought for sure you’d go bold, Jillian! Aren’t you the one who said, “Those look like mom colors?” I did think to put bold on the first coat, add crackle paint and then peach or white over that so the cracks would be bold. Let’s see what everyone else says. I’m leaning toward conservative, of course! April – I love white too. We are redoing our doors and trim white, so maybe white is the way to go to bring that into the room. Ok, now I have three choices – white, peach and bold orange! This is getting harder! Is the headboard black, grey, or pewter? Hold on to your horses – this is way out. I would paint it either to match the headboard – or – here it goes – BLACK! Then accents with peach or orange! BLACK furniture is very "cool" so it doesn't blend in with the walls. If that doesn't float your boat, then I'd go Orange! The headboard is pewter, but I’m not sure it’s going to stay because it doesn’t go with the rest of my house which is mostly in browns. Pam, you’re the second one to suggest black. I do love black furniture but I don’t have any in my house – all brown! I so want to be brave enough to go ORANGE but I don’t know if I have it in me! Hence, the survey! Definitely turquoise. It is the contrasting color. Paula, I thought about turquoise too but I’m not brave enough to do it! So many ideas! How will I ever decide? I think the bed spread is like at color changing dress. I thought it was hot pink and khaki! My phone is clearly playing tricks on me. What does the night stand look like? I also thought black. Or how about mirrored? 🙂 My friends whose decorating style is so wild and fun and I admire it greatly have this massive mirror that she spray painted the frame a patent orange and then she hung it at an angle in their wall. It's absolutely fabulous! I think you should do that! but that didn't answer your night stand question…. How about orange patent? Sarah, the nightstand is an antique, practically a square box on small legs. I’ve posted a picture of it on my facebook page. It has a narrow drawer with two doors below opening out. 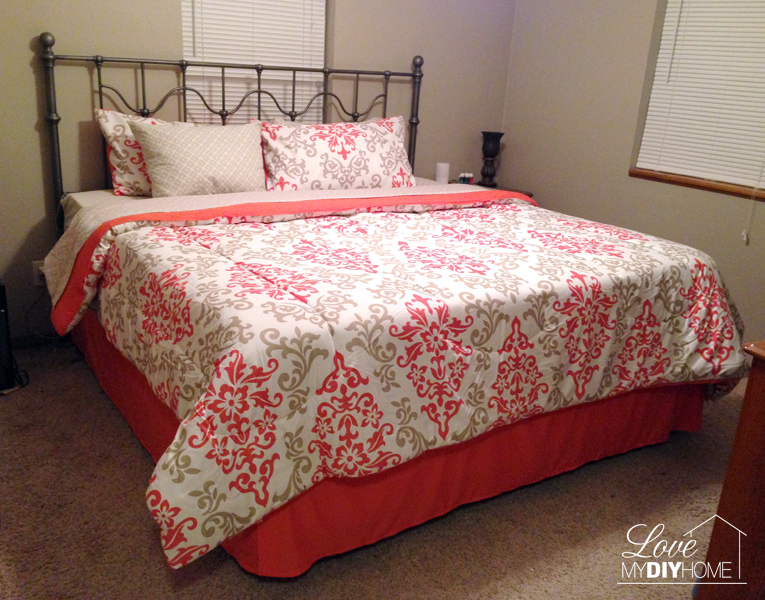 I did consider bright orange to match the bedspread, but most are saying it would detract from the bedspread. Others suggested black, taupe, white, light orange, bright orange, two toned etc. I think I will turn whatever color I go with into a chalk paint, so that would be the opposite of the patent, though I have considered that too! I still don’t know which way to go! Black wouldn’t go with my house or that room. Dark or light brown would since the walls are a med tan, a khaki.